I wasn't always a fan of chicken salad. With so many variations and some failed recipes I've tried, I eventually got turned off. But I've slowly built up my faith in finding a delicious chicken salad recipe that I'll come back to again and again. I think with Amy's recipe, I've found it! 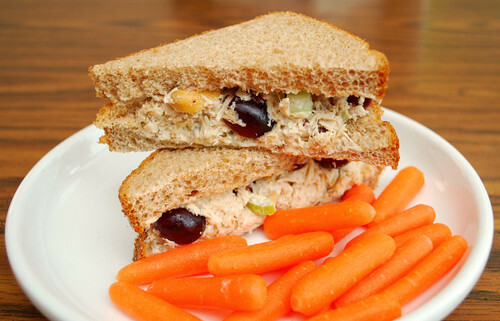 Her recipe for Crunchy, Fruity Chicken Salad caught my eye because it called for cashews, dried cranberries and a pinch of cayenne pepper... ingredients I don't always see in chicken salad recipes. The combination sounds delicious, not to mention her picture on her blog looked amazing and colorful. Making it was pretty easy. Instead of a rotisserie chicken, I roasted some bone in chicken breasts I had. I also added garlic powder since I've been on a garlic kick lately. The result is a very delicious chicken salad that I think is a real keeper. Thanks to Amy for sharing her recipe and hope you give it a try too! Mix all ingredients in a medium bowl and taste for seasoning; chill until ready to serve. I actually made chicken salad really similar to this today too! No garlic powder in mine, but sun-dried tomato seasoning instead. Great for using leftovers from last nights roast chicken! I'm so glad you enjoyed it!! It looks beautiful!! I usually make mine with apples and walnuts. So good!